Kurt Angle and Baron Corbin have a great history. Corbin was the reason that Angle was sent on vacation when he was RAW GM, but Angle got his retribution when he returned to the WWE dressed as a Mexican luchador, eliminating Corbin from a battle royal on RAW. Since then, Corbin and Angle have feuded on and off, with McIntyre joining hands with Corbin to get one over Angle. 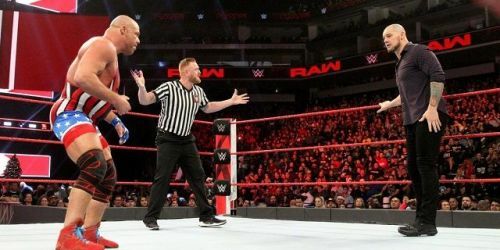 A match between Corbin and Angle at WrestleMania 35 could end the feud which has been bitter and personal between the two RAW Superstars. Perhaps WWE could add put the two Superstars in an "I Quit" match, where the loser also leaves the WWE. Corbin has enormous heat on him currently, while Angle is a much-loved figure on RAW, which works very well for the storyline, and we could see the two put on an interesting match at WrestleMania 35.